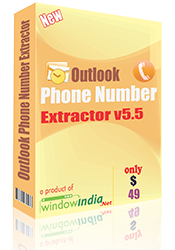 Outlook Phone Number Extractor is one of the most efficient number extractor software which extracts phone number from different MS Outlook Files. The Outlook number extractor can extract phone number from different personal folders and sub-folders. This phone number finder tool can extract phone number from folders like drafts, in-box, out-box, contacts, sent items, deleted items etc. The tool also allows the users to add a number of .PST files in addition to the default files to specifically selected accounts and profiles to recover outlook phone numbers. This phone number finder is extremely fast and reliable. It can automatically remove the phone number which is duplicates of the others. It also has filtering options which allow users in getting phone number which are actually required and relevant. The extracted outlook express phone number is saved in different formats. The extracted outlook phone number is saved either in .CSV which opens in Excel or .TXT which opens in notepad. The software is extremely handy and processes for extract phone number from folders in a single process. This phone number finder works in different versions of Outlook like 2003, 2007 and also 2012. It works in both 32 and 64 bit versions. The software can read very easily many PST file phone number at a time. The Outlook Phone Number Extractor helps the users to create their phone number list in minutes. It can easily read DBX file phone number and is extremely user friendly. It has an effective wizard and graphic interface which allows the users to extract the phone number easily. The phone number from Microsoft Outlook can be extracted in just a few mouse clicks. Many online businesses have adopted this tool to generate a relevant list of phone number of their clients. The tool has given a boost to the phone number marketing campaigns of different business organizations. It can be downloaded very easily. It works in different versions of Windows like XP, VISTA, WIN 7 and WIN 8.